With the Oculus Rift making horror games so much scarier, it was only a matter of time before a film would be named after the Latin word for an eye-shaped opening. An original story-line in horror goes a long way these days, as the vast majority of films are just re-workings of existing plots, remakes, sequels or prequels. To be honest, from the trailer it seemed as though Oculus was going to fit right in as one of those films. But thankfully the trailer didn’t reveal much in terms of the story-line; so you had no idea what to expect. That unexpected feeling stays with you throughout the entire picture. 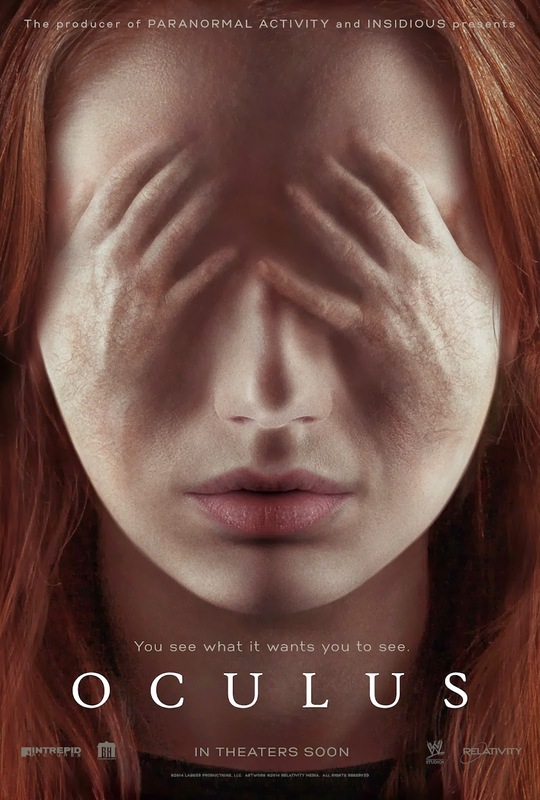 Oculus starts with a flash of the past, which depicts Tim (Brenton Thwaites) and Kaylie (Karen Gillan, best known for Doctor Who) who are two young children, and are in a desperate attempt to escape from a man with a gun and what appears to be some form of supernatural being. Fast forward 11 years and it appears that the man was their father (Rory Cochrane), and due to their family possessing a mirror called ‘The Lasser Glass’, he was unknowingly forced into killing their mother (Katee Sackhoff). The tale doesn’t end there though as now in present day, Kaylie decides that the mirror needs to be destroyed so that it can never cause anyone pain again. With the help of her recently released from incarceration brother Tim, they prepare themselves for a night of terror in the hope that by morning the mirror will be destroyed and they can put their horrible ordeal behind them. But as The Lasser Glass’ mind tricks begin to engulf them and their reality starts to sink back into what happened 11 years ago, the destruction of the mirror seems almost hopeless. When a film is only 20 minutes in and you have already jumped out of your skin to man kicking a box then you are probably onto something. The creepy atmosphere that Oculus creates is what, among other things, really draws you in, it grabs hold and rattles about your every last nerve. The viewer begins to embody the characters themselves, their fears become yours, and Kaylie and Tim escaping this nightmare feels all that more vital as you are trying to escape it as well. Director Mike Flanagan really did an excellent job of intertwining the realities, we are shown both the story from 11 years ago and the one in present day. When the older Kaylie and Tim begin to remember what happened to them, they are thrust back into reliving those horrific days when The Lasser Glass took over their family. Although at some points you may feel lost, as soon as a scare comes through you get your bearings back. You really have to otherwise you won’t be able to prepare yourself for the next jump. When you look at films such as Signs, Halloween or The Thing, they are such landmark films that give us the shivers even to this day; and one of the main reasons is the music score. Some simple notes can add a lot of terror to a film, tunes that will stick with you even after the film has ended. Oculus is one of those films, its bassy long notes, which are uncovered when the cast are running frantically from the antagonists, almost resemble an air raid siren. Something audiences recently saw in 2012’s Evil Dead remake. When those sirens start-a-comin’, you better be-a-runnin’. You are constantly guessing with Oculus, although you can follow the plot. What will mystify you is the mirror itself, as it isn’t so much a being, but more a force. We aren’t really indulged into its power until about half way through the film as well, so when the scares come, and they do, you really don’t know what to expect. Tag Line: You See What It Wants You To See.